South Korean auto giant Hyundai Motor has unveiled the world’s first holographic augmented reality navigation system equipped on its luxury sedan Genesis G80 in partnership with Swiss startup WayRay, the company said Wednesday. Introduced at the Consumer Electronics Show being held in Las Vegas, the holographic AR navigation technology delivers driving guidance by projecting navigational alerts through the windshield onto the road, the company said. The two have been collaborating since last September to develop holographic AR navigation technology in mass-produced vehicles. In addition, road tests have been conducted in South Korea to minimize system errors, it added. 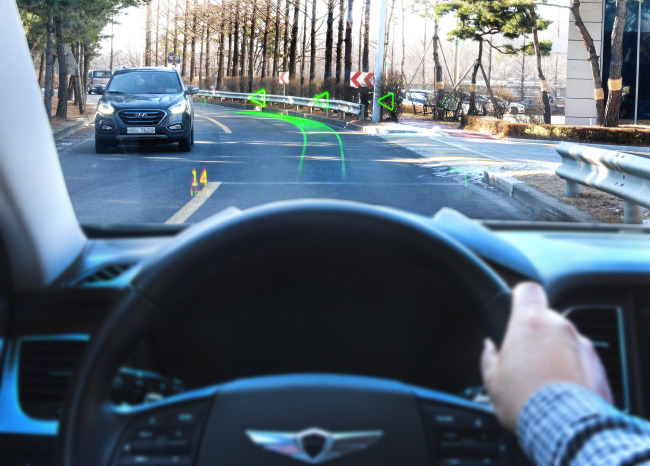 Hyundai Motor is a strategic investor in WayRay. The holographic AR display also incorporates ADAS features like lane departure warnings and forward collision warnings, along with navigational features, such as lane guidance, destination points, and current speed in augmented reality, the company said.